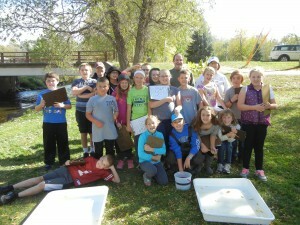 Macroinvertebrates as Water Quality Indicators! 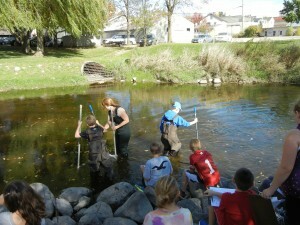 How healthy is the creek that runs through our village? 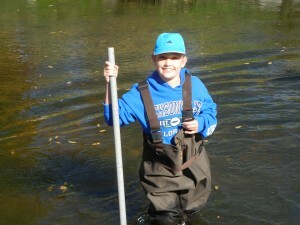 Is the water quality excellent, good, fair or poor? 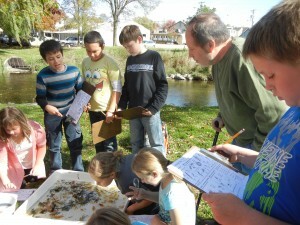 Can the macroinvertebrates we find in the creek tell us what we want to know? These are the questions we were determined to answer. But first we needed to know a few things. When I first mentioned that instead of chemical testing the water, we would use a biotic index, I got a few blank looks. Okay, I got a lot of blank looks. But then I wrote the word <biotic> on the board and asked what the base was. Since we had previously investigated the following list (words coming up in our science curriculum) , focusing on word structure, modern bases from Greek that take an <o> connecting vowel, the Greek <ph> spelling that represents /f/ and the identification of free and bound bases within a compound word, the students were able to recognize the now familiar base <bi>. I’ve just found one more way I will broaden their enjoyment of research this year! Do you see how they stopped reading at the first description of the word? They missed gathering a broader sense of the word. I think this comes from “Get out a dictionary and write definitions of this list of words.” To students who see no reward for all of the upcoming writing they are about to do (no discussion – no connection to a particular topic), the way to get it done is to look for the shortest definition possible! This year I will give my students practice at reading an entire entry and mulling over the bigger sense of the word before deciding on a definition. Why, we might even decide that the definition varies slightly depending on the affixes used with the base! Back to <biotic>! When the definition “one’s life” came up, I said that if we are talking about a biography, that certainly makes sense, since a biography is the writing or story of one’s life. 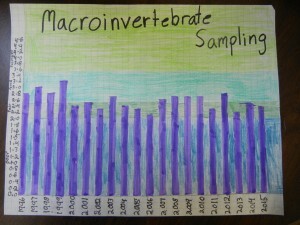 But when talking about a biotic index, we are talking more generally about living things. 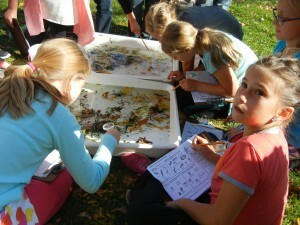 In this case, we will be using living things (macroinvertebrates) to tell us about the quality of the water. 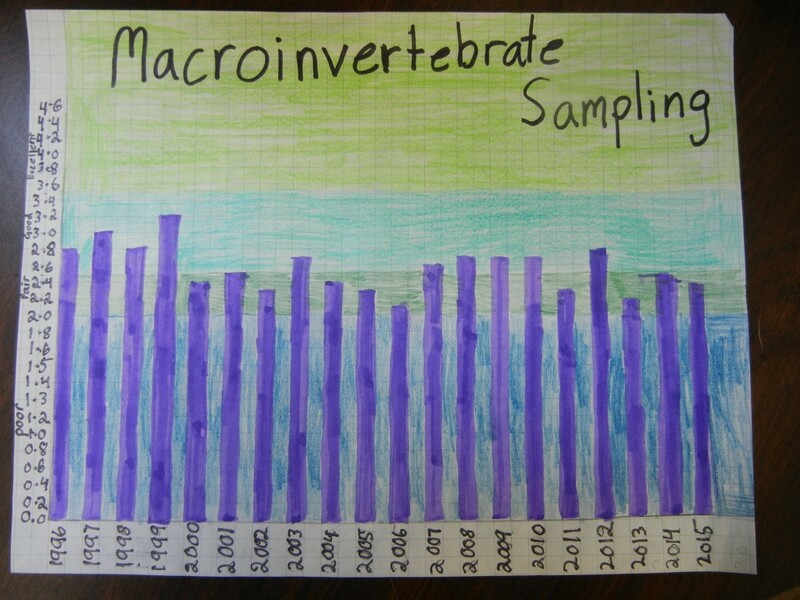 As you can probably guess, the word <macroinvertebrates> was next. 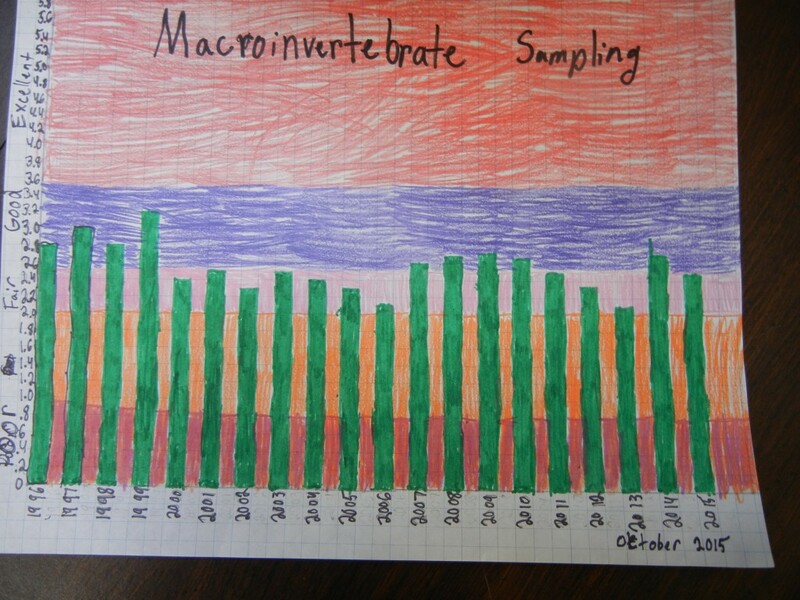 The students already understood what a vertebrate and invertebrate were, but were unfamiliar with the prefix <macro->. We had a delightful discussion of the prefixes <micro->, <macro->, and <tele->! 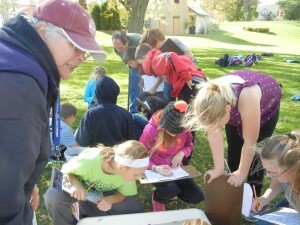 The things we see with a microscope are tiny and often not able to be seen with the naked eye. 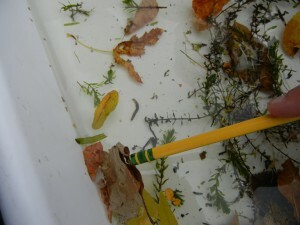 The macroinvertebrates are longer and larger and we CAN see them with our naked eye. And using a telescope allows us to see things that are far away. All three refer to our ability to view things and the relative size of those things! Delightful. 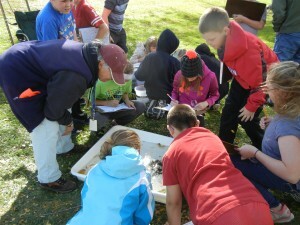 Next it was time to become familiar with some of the macroinvertebrates we might find in the creek. 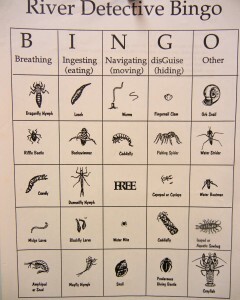 We used a scientific key and played bingo. Here is the key we used and a sample bingo card. 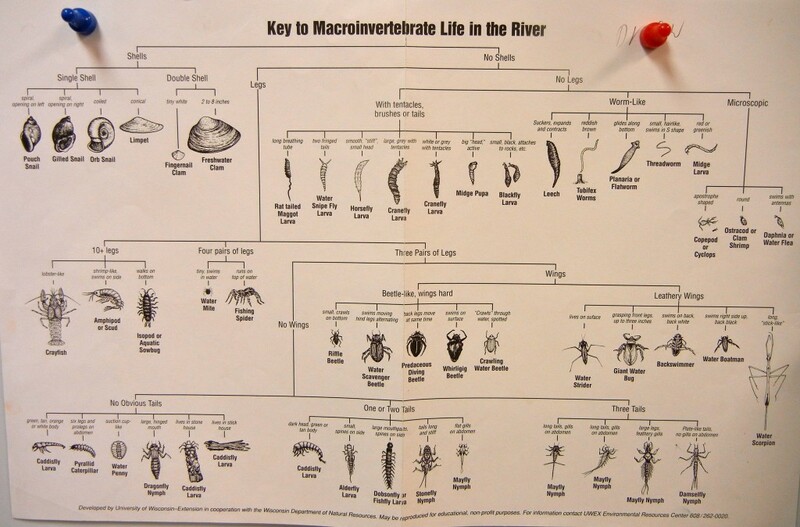 The thing I love about using this scientific key is that over and over the students get the idea that identification of a macroinvertebrate is orderly. We start with the same question every time – Does it have a shell? 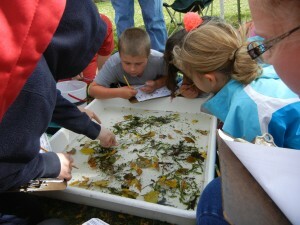 [Definitely reminds me of Structured Word Inquiry. We start with the same questions every time – What does it mean? How is it built?] So here’s how we played. I gave a scenario each time that went something like this. 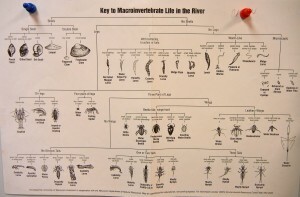 “I went to the Koshkonong Creek the other day and saw the coolest macroinvertebrate! 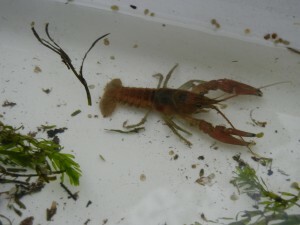 It did not have shells, but it did have legs. In fact it had three pair of legs. 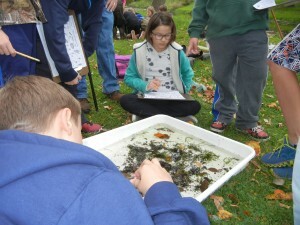 It had no wings, and I couldn’t really see if it had tails or not because it was in a little stone case!” The students would follow along on the key until they found the caddisfly in the stone case. Then they would find it and mark it on their bingo card. 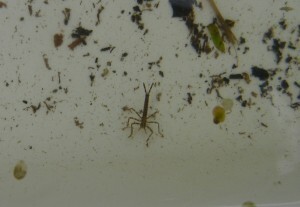 I would continue on and describe having found another macroinvertebrate. 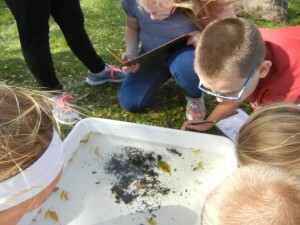 In the end, the students had learned how to use a scientific key and the type of details to pay attention to when identifying the macroinvertebrates in our creek. We were now ready to head down. I have three classes, so this “health check” happened three times on the same day. 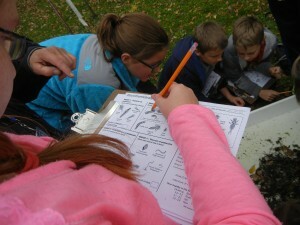 The students were keeping track of what they saw with a Macroinvertebrate Tally Sheet. 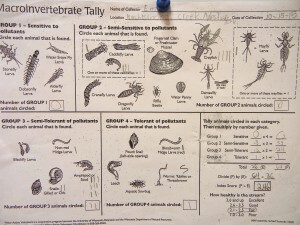 If they were not sure if their identification was completely accurate, they asked our guest, Jeff Steven, who is an aquatic entomologist. 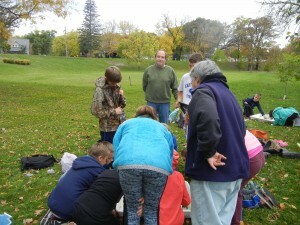 For more than 30 years, he used a biotic index to monitor the water that had been discharged from the Nine Springs Wastewater Treatment Plant in Madison, Wisconsin. 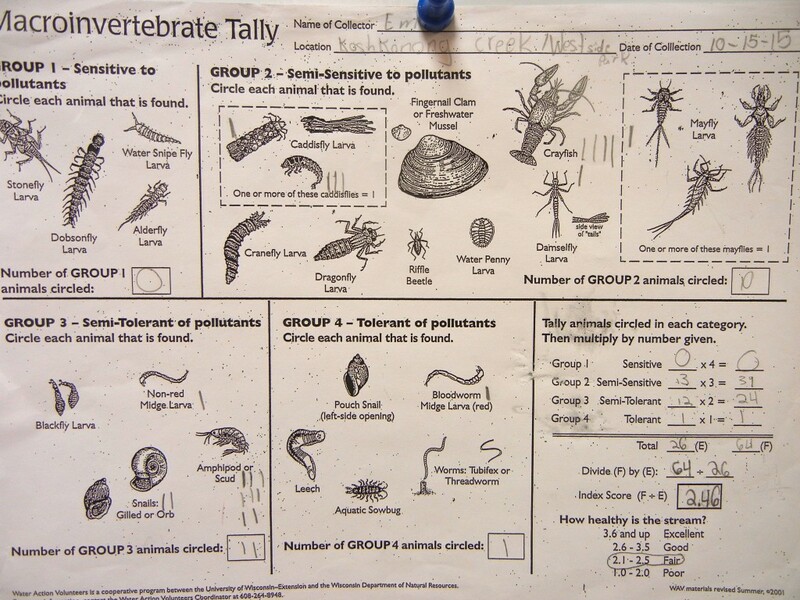 Here is an example of the tally sheet used by the students. All three fall within the “Fair” category, although the first group was only within .04 of the “Good” category. 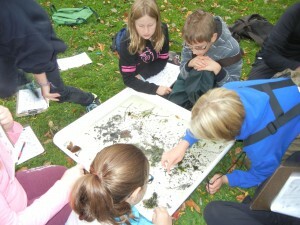 Did it make a difference that we sampled in the same area all day long? Perhaps. 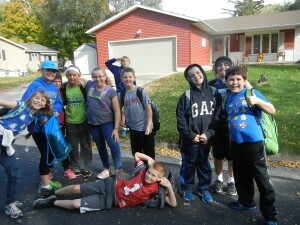 Did it make a difference that the air temperature rose throughout the day? Perhaps. But all in all, our results are solidly in the “Fair” category, and not close to the “Poor” category which begins at 2.0. So how do this year’s findings compare to last year’s or the year before that? 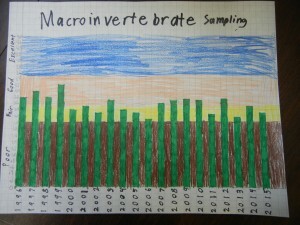 Here are a few of the graphs the students completed. I think a very fascinating story emerges as you look at the data compared all the way back to 1996. 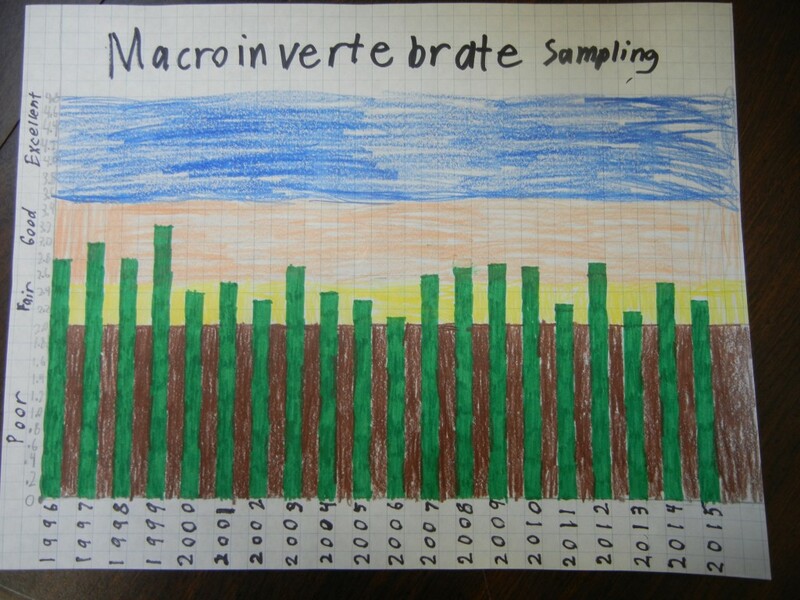 A few students are still finishing up their graphs. 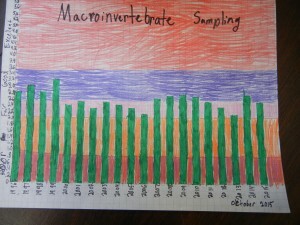 The discussion we’ll have next will involve identifying the factors that affect this data and score. 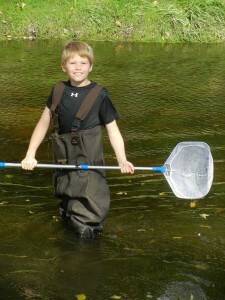 It will include things like rainfall, habitat disruption, macroinvertebrate identification error and human activity upstream. We’ll check sources to determine when the dam was removed downstream, and when the new water treatment plant was built upstream. 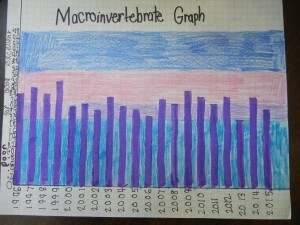 Even if we determine those things to have had an effect on the final score for any given year, the graphs show a level of consistency over the last 19 years. 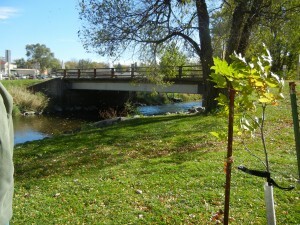 We never determined our creek to be of excellent water quality, and even though we came close in 2006, we never determined our creek to be of poor water quality either. 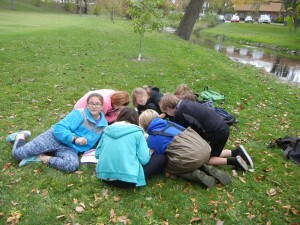 A fascinating activity that shows us how our hydrosphere, geosphere, atmosphere and biosphere interact to sustain habitats and populations! 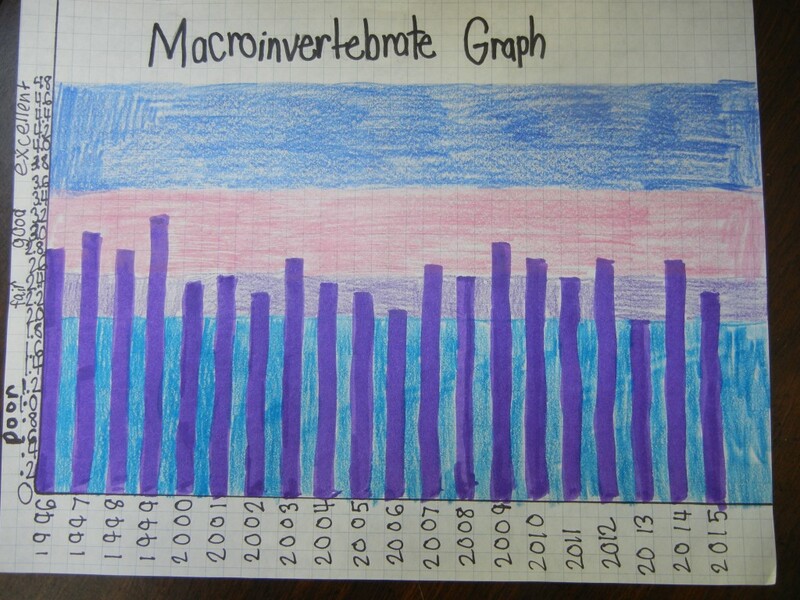 This entry was posted in Orthography, Science and tagged atmosphere, biosphere, biotic index, geosphere, hydrosphere, longitudinal data collection, macro-, macroinvertebrates, micro-, scientific key, tele-. Bookmark the permalink. I would be happy to share. Send a request to my school email. 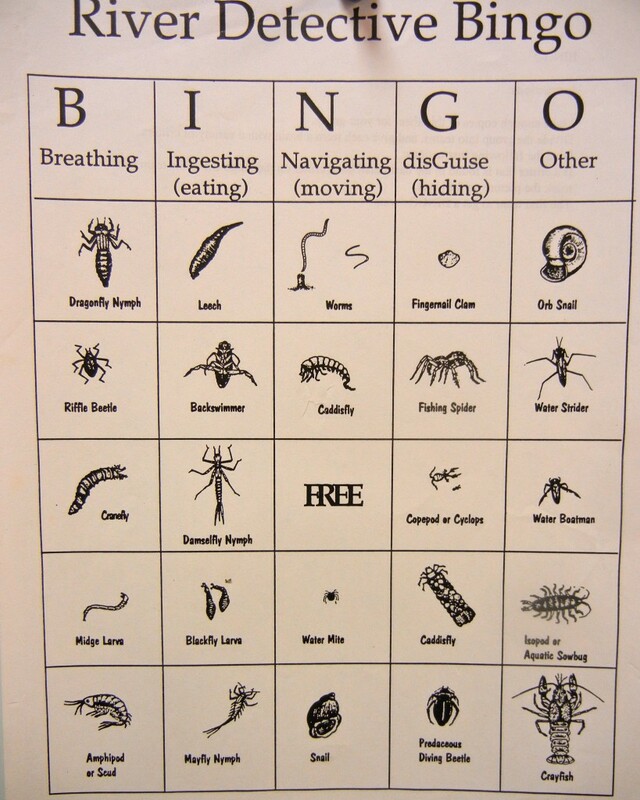 Include your address and I will send you copies of the bingo cards (I have 4-5 different cards) and the Key to Macroinvertebrate Life in the River. Where can I get that bingo card?